Mariner Mountain from subpeak of Big Interior Mtn. 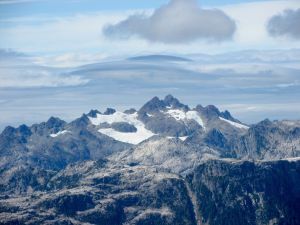 Located on the west coast of Vancouver Island, north of Tofino and on the divide between the Bedwell and Moyeha rivers. The summit is almost surrounded by glaciers, which is pretty unsusual for this area. Access is by boat from Tofino to the head of Bedwell Inlet. From a logging road along the Bedwell River bushwhack north up Noble Creek to the glacier south of the summit. Reaching the summit involves 35 degree ice, hard avalanche debris slopes, and Class 4 rock. Name Notes: Mariner Mt used to be called Holy Cross Mt because of prominent crossed rock dykes visible, after snow melt, to mariners on Bedwell Sound and beyond.